"The truth of a story lies in the details." One of the pleasures of the wedding day is photographing all the details of the bride. In a way, as we photograph all the personal belongings she selected so carefully one by one at the beginning of the day, we are getting to know the bride herself. The fonts of her wedding invitation, the design of her jewelry, the color of her shoes, and of course the cut of her dress all reveal her personality and style. Sometimes family or guests will ask - why would we want photos of inanimate objects? But the answer is simple: these individual details are what make every wedding different, and are unique to the couple. They are the conclusion of hours of planning and represent all the hope and excitement of this day. And like all details, they will fade from memory. 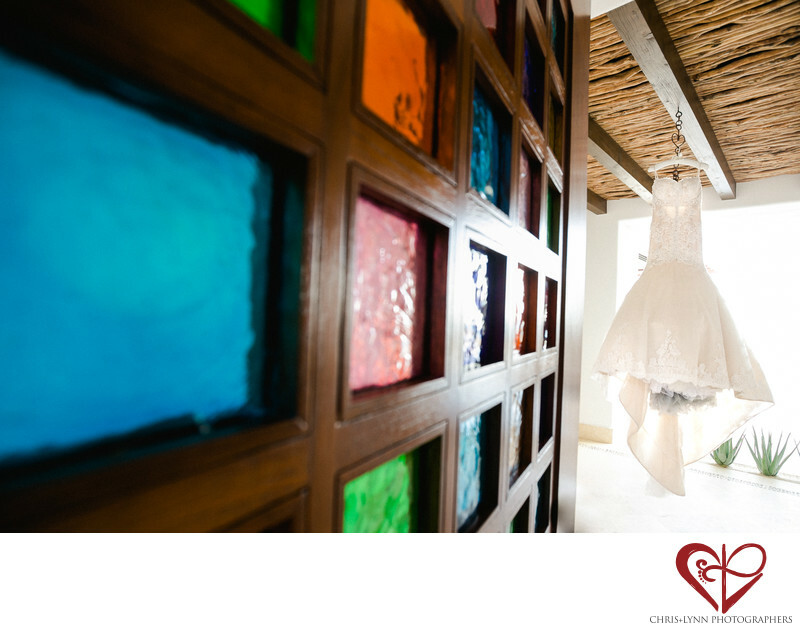 To showcase this bride's gorgeous Pnina Tornai gown, we chose to hang it from the rafters of the roof of the private villa at Las Ventanas where she was preparing with her bridesmaids. The stained glass of the doorway to the villa leads the eye to the delicate dress, and also gives a sense of the luxury of this getting ready location. I doubt there could be a more perfect place to prepare for your wedding day; complete with butler, private pool, jacuzzi, three suites, and direct beach access, the villas have everything you need to enjoy a relaxing morning getting ready for the wedding. Location: Las Ventanas al Paraiso, A Rosewood Resort, Carretera Transpeninsular Km 19.5, Cabo Real, 23400 San Jose del Cabo, B.C.S., Mexico. 1/50; f/4.0; ISO 400; 16.0 mm.